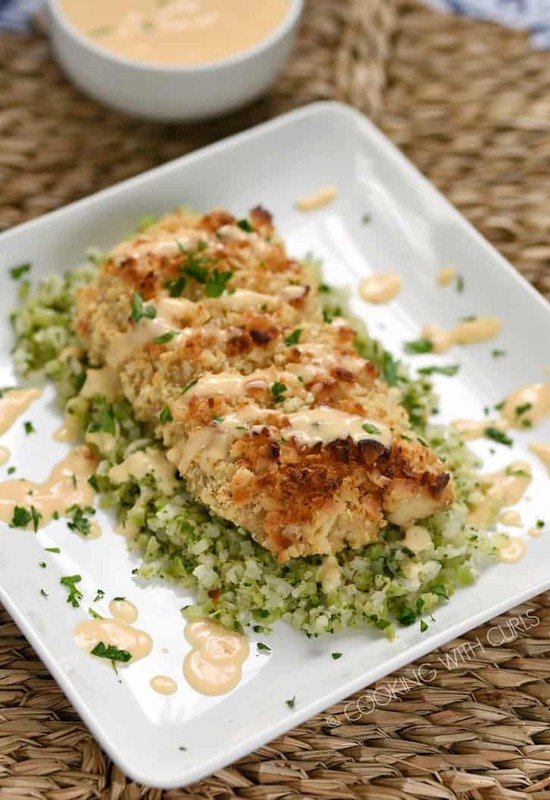 Macadamia Nut Crusted Mahi-Mahi drizzled with Sweet Chili Lime Butter Sauce is a quick and easy meal that is Keto, Whole30 and Paleo friendly. 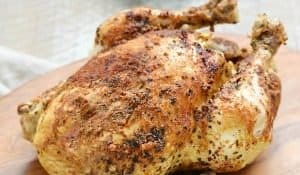 If I owned a restaurant, this would be the first recipe added to the menu! 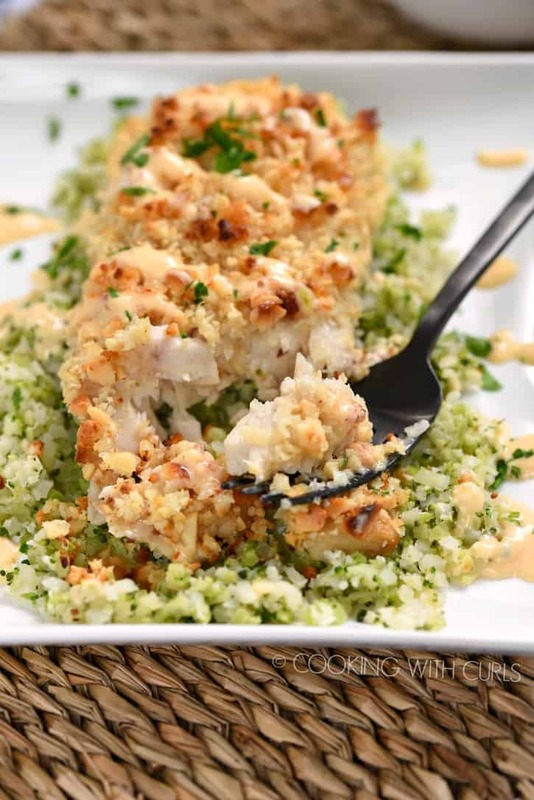 Mahi-Mahi does not have the “fishy” taste that some seafood has, the nuts add just the right amount of crunch…..
and the Sweet Chili Lime Butter Sauce is A-M-A-Z-I-N-G!! I could drink this sauce, it was the perfect addition to the meal and tied all of the flavors together. Preheat oven to 425 degrees. Spray a baking sheet with olive oil and set aside. and place them in a shallow bowl with the cayenne pepper. Mix to combine. 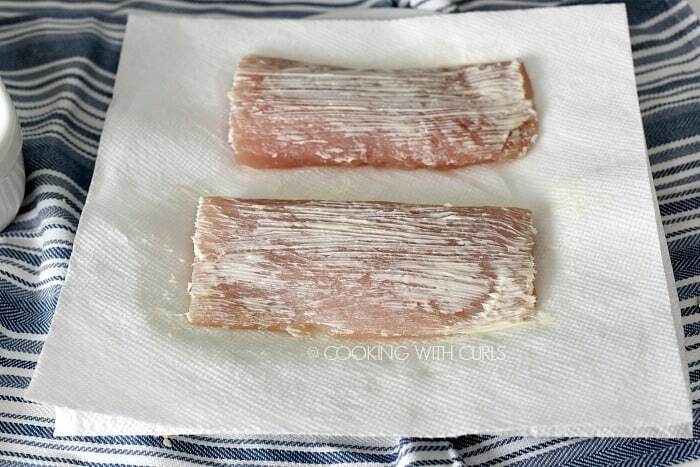 Dry the mahi-mahi filets with a paper towel, then brush the top with softened butter or coconut oil. 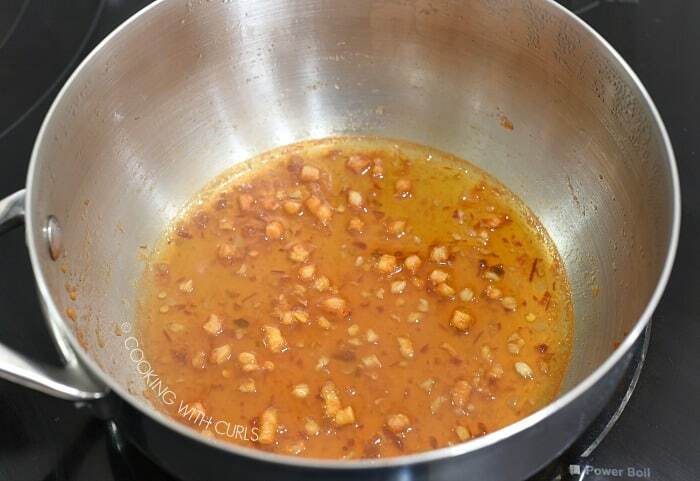 Press the filets into the chopped nut mixture as evenly as possible. Place the filets in the prepared baking pan. 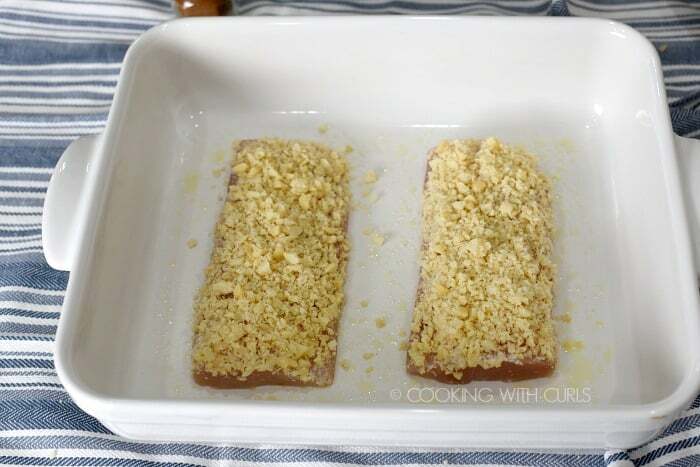 Sprinkle additional nuts over the filets to fill in any blank spots. 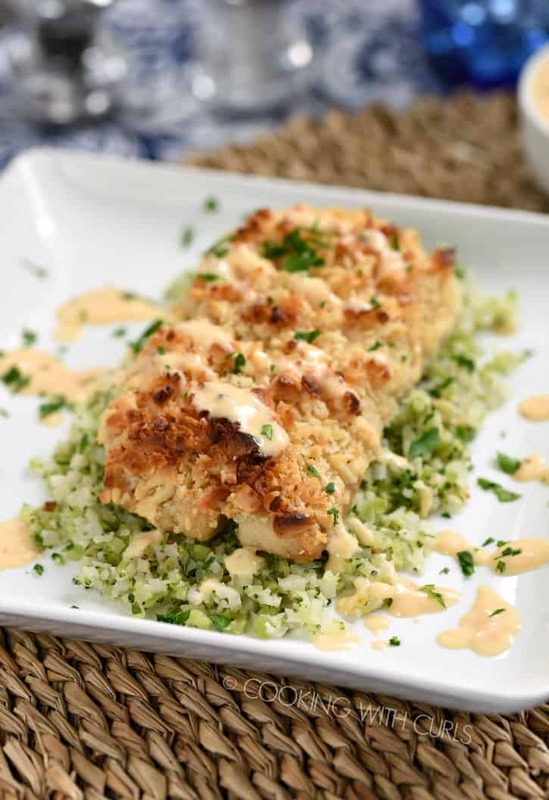 You could stop right here and serve your Macadamia Nut Crusted Mahi-Mahi as is, but what fun would that be? Trust me, it is worth a couple of extra steps!! 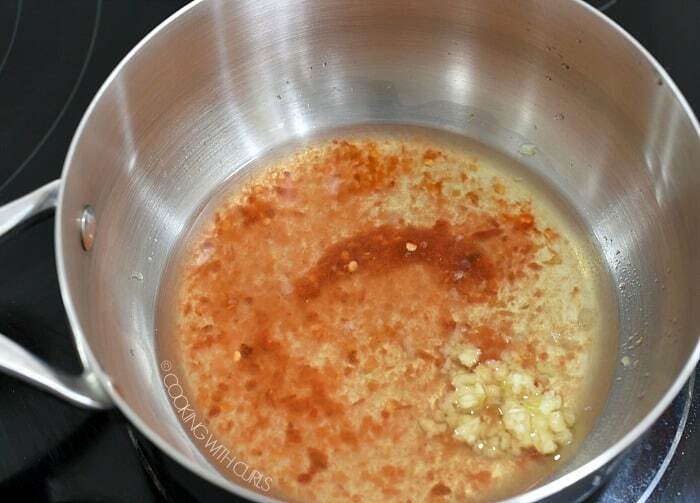 Add the chili-garlic sauce, lime juice and white wine to a saucepan. Stir to combine. Heat over medium-high heat allow mixture to simmer until reduced by 1/3rd, about 10 minutes. 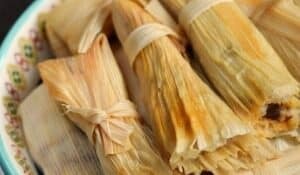 Pour the mixture into a small bowl and set aside. 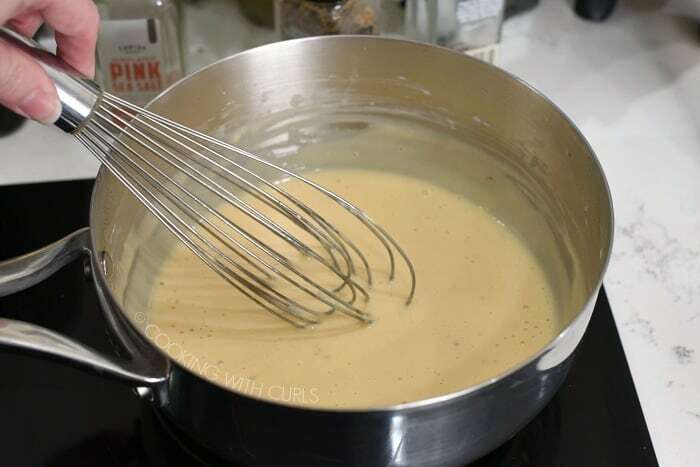 Pour the heavy cream into the saucepan. Simmer over medium heat until reduced by 1/3rd, about 5 minutes, whisking occasionally to keep it from sticking to the bottom. 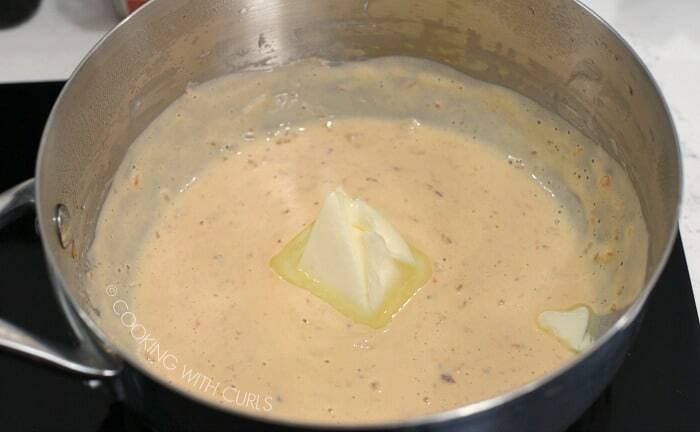 Reduce heat to medium-low and whisk the chili garlic mixture into the cream. 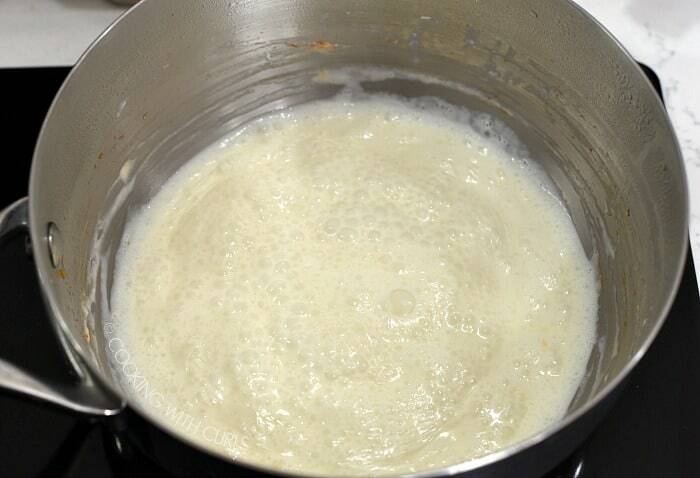 Add the butter/coconut oil to the saucepan about 2 Tablespoons at a time, whisking to combine. Add the stevia and continue whisking until all of the butter thoroughly incorporated. 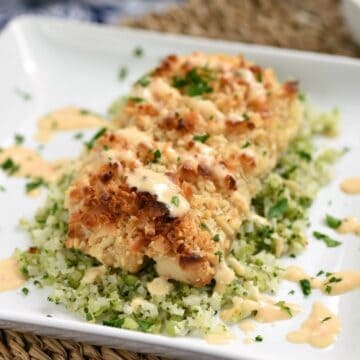 Drizzle the Sweet Chili Lime Butter Sauce over the Macadamia Crusted Mahi-Mahi, sprinkle with chopped cilantro and serve immediately. Seriously, this is THE ultimate Date Night meal! To make the nuts crunchier, place under the broiler for a couple of minutes. 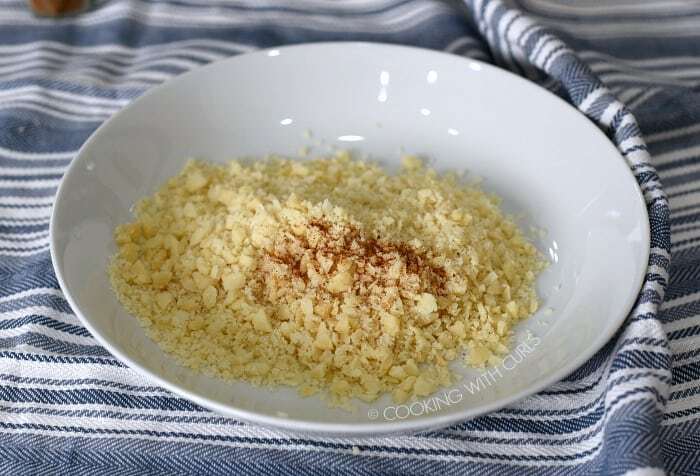 You can chop the macadamia nuts in a food processor if you prefer, just don’t let it process for too long or you will end up with macadamia nut butter! This Sweet Chili Lime Butter Sauce is on the spicy side. For a family friendly version, omit the cayenne pepper and reduce the amount of chili garlic sauce. 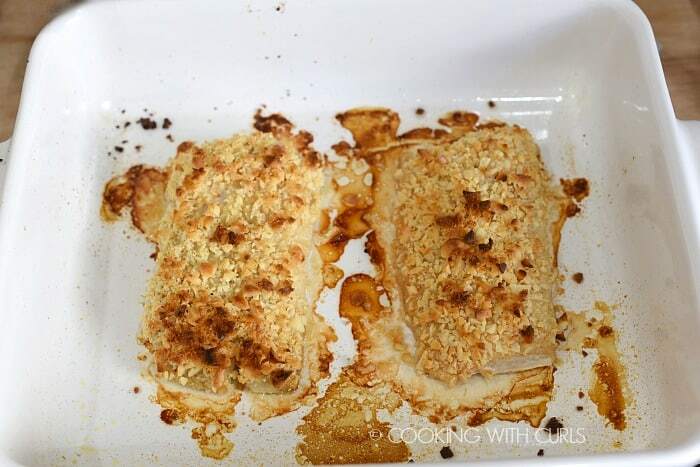 Substitute ghee or coconut oil for the butter brushed on the fish. Replace the white wine with seafood stock. Substitute canned coconut milk for the heavy cream. Replace the stevia with date paste or omit all together. 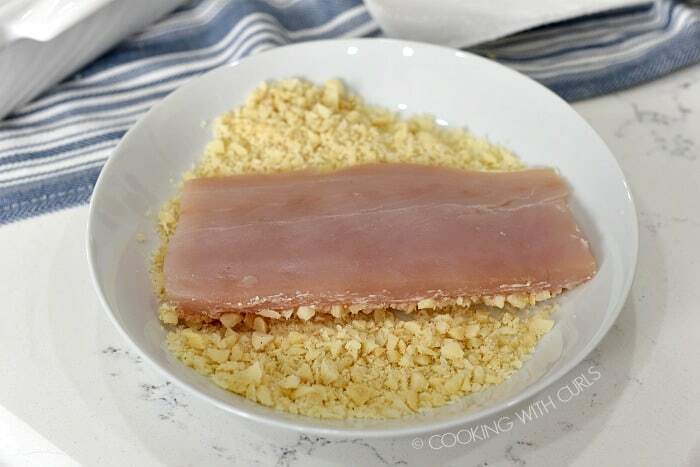 Macadamia Nut Crusted Mahi-Mahi with Sweet Chili Lime Butter Sauce is a quick and easy meal that is Keto, Whole30 and Paleo friendly! 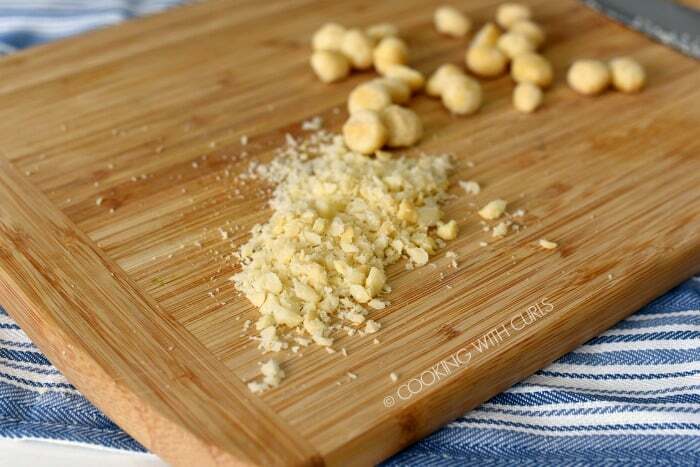 Chop the macadamia nuts and place them in a shallow bowl with the cayenne pepper. Mix to combine. There is enough sauce for 4 servings. 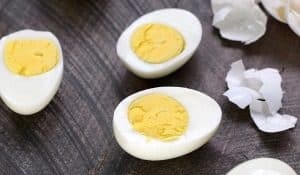 Nutrition Facts are guidelines, but not guaranteed to be perfect. Actual amounts will vary based on ingredients used. Ex. 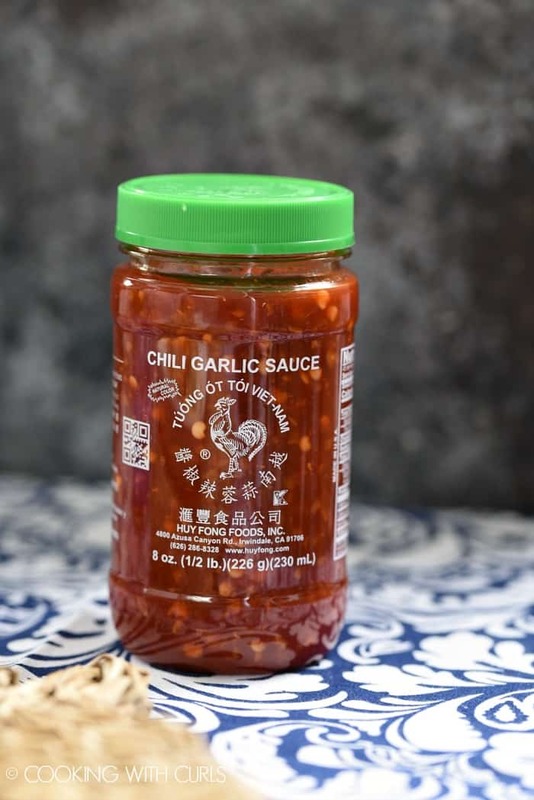 chili garlic sauce has 0 carbs but the calculator seems to think it has 3.9.